Rescuers searched for survivors in the rubble of houses, mosques and schools that were among the thousands of buildings destroyed in the earthquake in Indonesia. Indonesian security forces and emergency workers raced Monday to aid victims of a powerful earthquake on Lombok that killed at least 91 people, as strong aftershocks sparked terror on the holiday island that suffered another deadly quake just a week ago. Rescuers searched for survivors in the rubble of houses, mosques and schools that were among the thousands of buildings destroyed in the disaster that struck on Sunday evening. “The search and rescue team is still scouring the scene and evacuating (people),” national disaster agency spokesman Sutopo Purwo Nugroho said. The quake triggered a tsunami warning, which was later cancelled, and was also felt on the neighbouring island of Bali, one of Southeast Asia’s leading destinations, where tourists ran onto the streets as the tremor struck. The shallow 6.9-magnitude quake sent thousands of Lombok residents and tourists scrambling outdoors, where many spent the night as strong aftershocks including one of 5.3-magnitude continued to rattle the island. The quake knocked out power in many areas, and parts of Lombok remained without electricity on Monday. 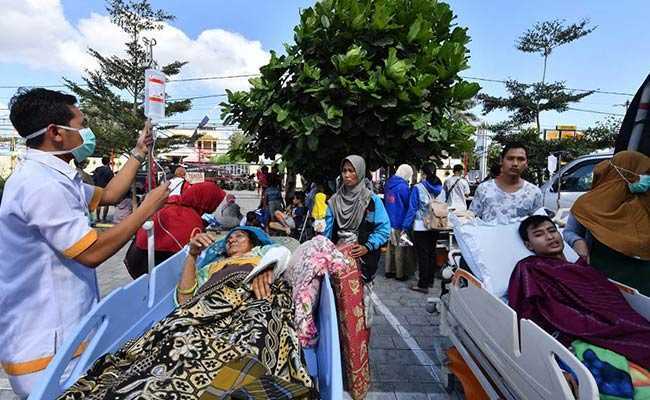 Hundreds of bloodied and bandaged victims were treated outside damaged hospitals in the main city Mataram and other hard-hit parts of the island. Patients lay on beds under makeshift wards sent up in tents, surrounded by drip stands and monitors, as doctors in blue scrubs attended to them. 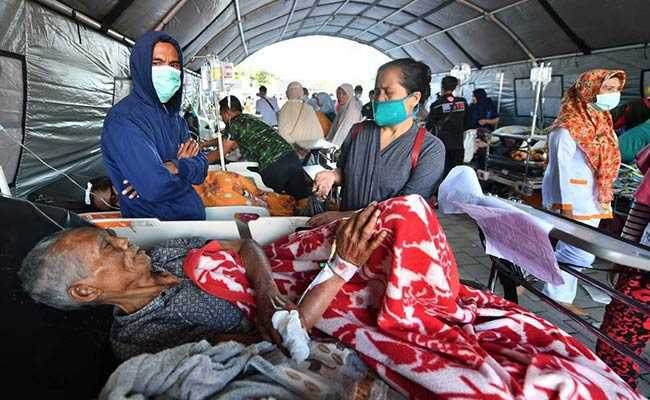 “Many injured people are being treated outside of hospitals and health clinics because the buildings were damaged,” Nugroho said. Most of the victims were in the mountainous north and east of the island, away from the main tourist spots and coastal districts in the south and west. Najmul Akhyar, the head of North Lombok district, estimated that 80 percent of that region was damaged by the quake. “We need heavy equipment because some mosques have collapsed and we suspect some worshippers are still trapped inside,” he told Metro TV. It was the second quake in a week to hit Lombok, whose beaches and hiking trails draw holidaymakers from around the world. That 6.4-magnitude quake left 17 people dead, damaged hundreds of buildings and triggered landslides that briefly trapped trekkers on popular mountain hiking routes. In the latest quake, facilities at Lombok’s main airport were unaffected, although passengers were briefly evacuated from the main terminal. Singapore’s Home Affairs Minister K. Shanmugam, who was in Lombok for a security conference when the earthquake struck, described on Facebook how his hotel room on the 10th floor shook violently. 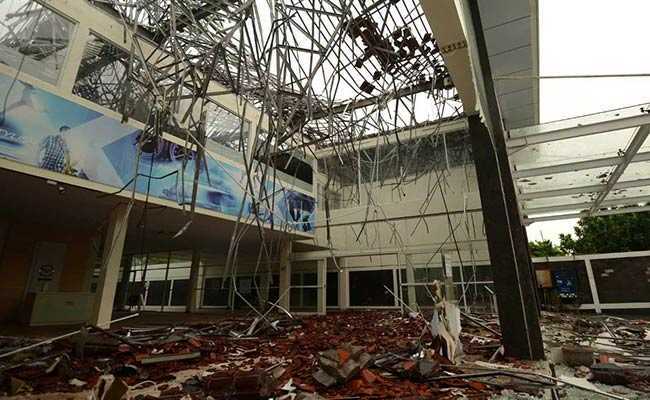 Bali’s international airport suffered damage to its terminal but the runway was unaffected and operations had returned to normal, disaster agency officials said. Indonesia, one of the most disaster-prone nations on earth, straddles the so-called Pacific “Ring of Fire”, where tectonic plates collide and many of the world’s volcanic eruptions and earthquakes occur. In 2014, a devastating tsunami triggered by a magnitude 9.3 undersea earthquake off the coast of Sumatra in western Indonesia killed 220,000 people in countries around the Indian Ocean, including 168,000 in Indonesia.